GTS NX also incorporates a hybrid mesh generation function that creates mesh set that use an optimal combination of hexahedron and tetrahedral elements. The main advantage of using hexahedron elements is that they generate comparatively more accurate stress results than tetrahedral elements; and the advantage of using tetrahedral elements is that they are more effective for modeling sharper curves and corners of complex geometry . GTS NX is capable of utilizing both tetrahedral and hexahedron elements without any significant loss in modeling or analysis speed. 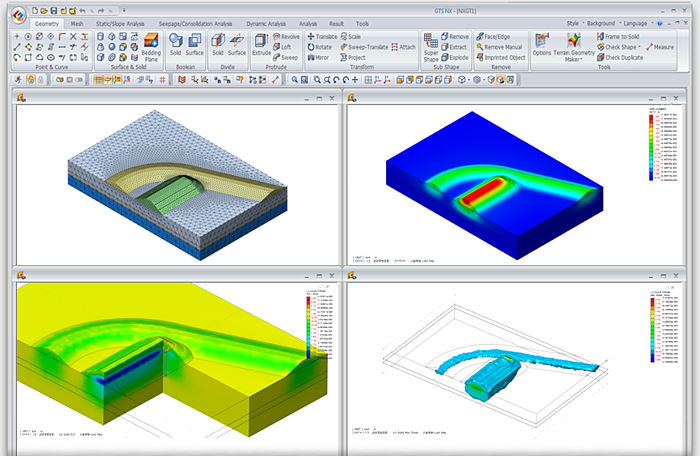 Project sites that contain complex contour surfaces can take hours to model with basic CAD-based commands. Typically idealizations are made in the interest of time, which in turn leads to a decrease in accuracy of the final analysis. 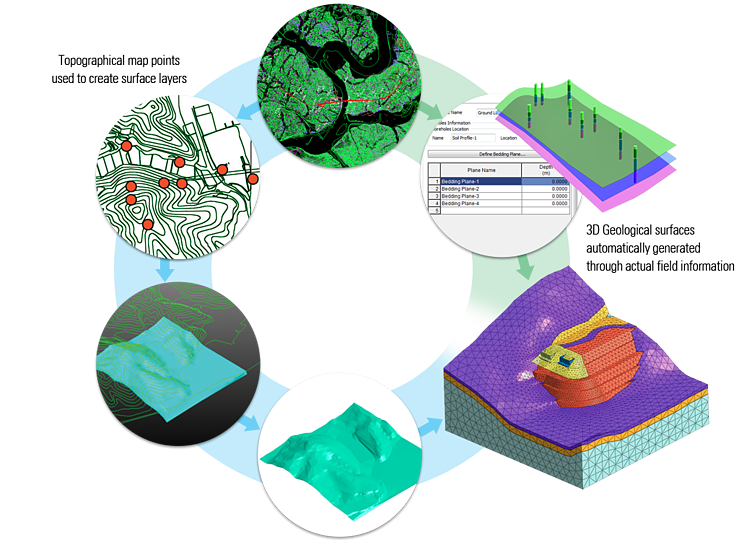 GTS NX features a high-end Terrain Geometry Maker (TGM) that automatically converts topographic maps into editable surfaces. With the TGM you can easily generate intricately detailed 3-dimensional contour surfaces within seconds. GTS NX is also equipped with a Bedding Plane Wizard that enables you to model uneven soil strata with ease. You can directly utilize your soil profile by entering the boring log data for several coordinates. The program the will then automatically extrapolate the changes in soil levels between each point. and thus makes it possible to obtain results that are more accurate than those obtained through models that conservatively assume level soil strata conditions. Engineers who have their projects drawn on CAD often find that they need to redraw their entire project on the analysis software when it comes time to model their design. 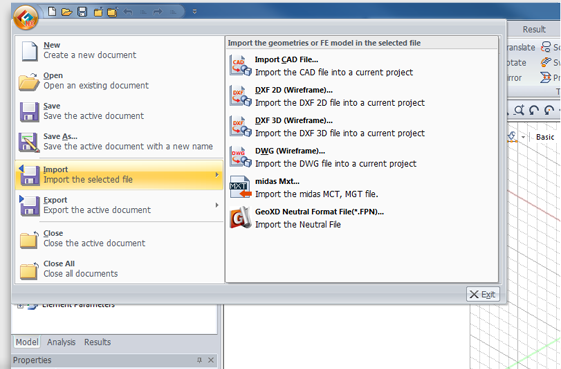 GTS NX enables you to import your CAD drawings directly into the program. This feature completely eliminates the need to recreate existing drawings on the program and will thus save you considerable amounts of time and effort. 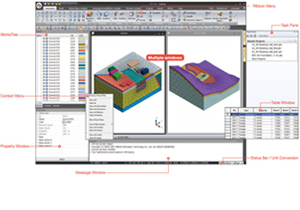 GTS NX also has CAD-based commands that are similar to the standard CAD modeling interfaces that are most typically used by engineers. This eliminates the need to learn a new and unfamiliar interface and makes it easy for all engineers to create their project drawings and revisions solely with the software. The use of multiple geotechnical programs creates the need to learn the unique interface of each program. Even more inefficiencies arise when there is a need to perform various analyses for the same project. For example, dam and levee projects often require seepage, settlement, slope stability, and seismic analyses to be calculated. The same also applies to foundation and retaining wall projects that require soil structure interaction as well as stress deformation analyses to be performed. Most geotechnical programs can only perform one analysis type, which creates the need to tediously create the same project model for several programs. With GTS NX you will no longer need to rely on several different geotechnical programs to perform various analyses. 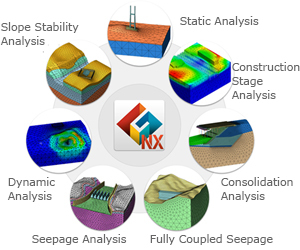 Instead you will be able to use GTS NX to perform any type of geotechnical analysis application. GTS NX can perform both single and group pile interaction as well as complex tunnel analysis in either 2D or 3D. Linear static analysis, seepage, soil structure interaction, SRM slope stability analysis and a wide range of dynamic analysis applications can be done as well. Moreover, your efficiency will be greatly increasedby the ability to run multiple analysis types on a single model file. especially for programs in which don't have input options that have been designed to expedite the parameter entry process. 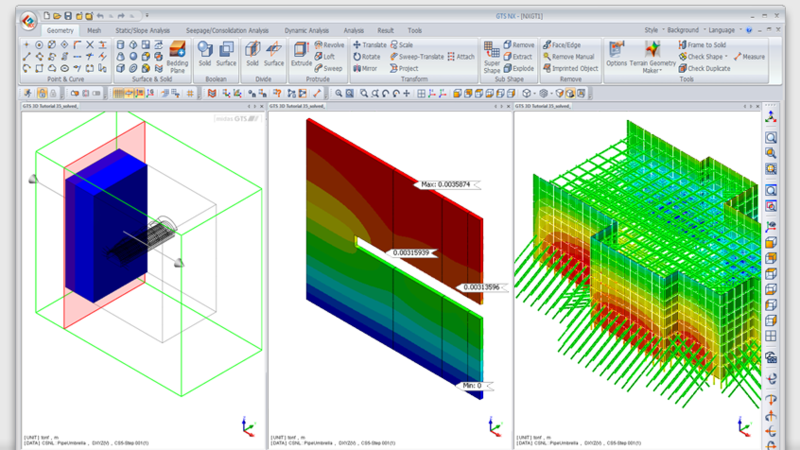 When performing construction stage analysis, it is often necessary to create multiple models to compare the effects of a variation of design considerations. This process is made particularly cumbersome by the need to open a separate model file for each analysis case. 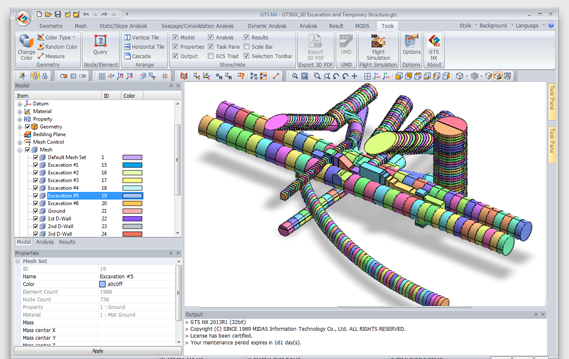 GTS NX overcomes this limitation by its unique ability to have multiple construction stage analysis cases modeled in a single file. This feature makes it possible to directly compare the results of various construction stage analysis cases and determine the optimal design for your project. A common inefficiency of using finite element analysis software is having to painstakingly sort through extensive amounts of output data to extract the desired results. In most cases, creating the report can take just as long as the design and analysis process. and create beautifully detailed and high quality reports. 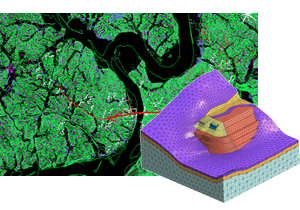 The post-processor renders richly colored 3D contour plots that provide detailed visual representations of the results. The post-processor also includes fully customizable filters so that you can easily extract your desired results based on construction stages, time history analysis, coordinates, and various other criteria. thus freeing up more time for you to devote to other high priority tasks. GTS NX has various advanced modeling functions that will enable you to model even the most complex projects with unmatched levels of ease and precision. With GTS NX you will no longer need to rely on several different geotechnical programs to perform various analyses. 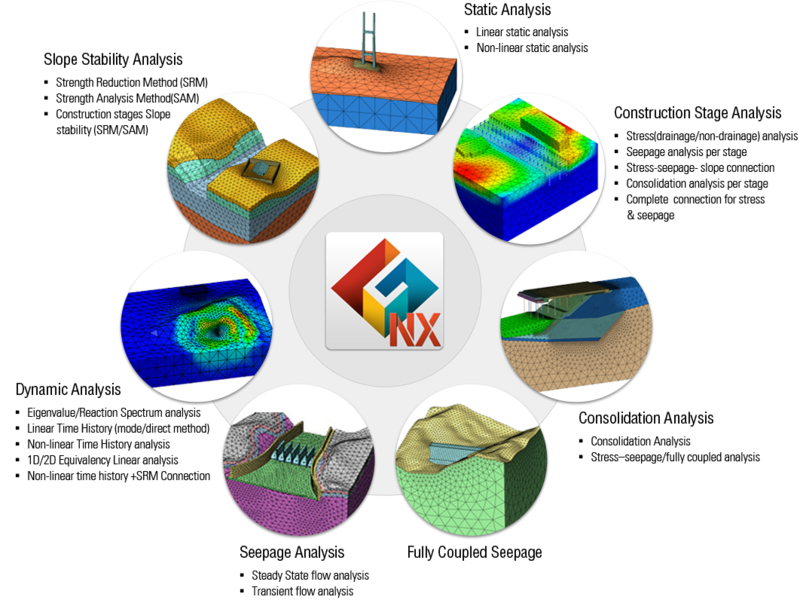 Instead you will be able to use GTS NX to perform any type of geotechnical analysis application . 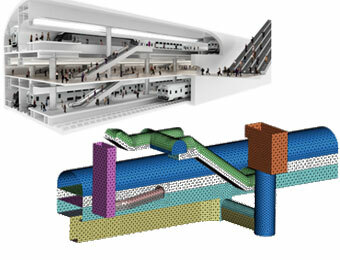 GTS NX can perform both single and group pile interaction as well as complex tunnel analysis in either 2D or 3D. Linear static analysis, seepage, soil structure interaction, SRM slope stability analysis and a wide range of dynamic analysis applications can be done as well. 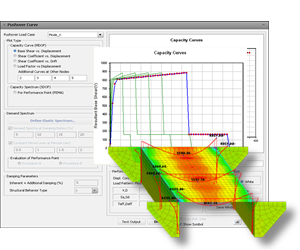 Through its advanced graphic processing engine, GTS NX provides a variety of output methods for users to visualize and extract their analysis results. The extensive output options present results in an elegant and comprehensible form. 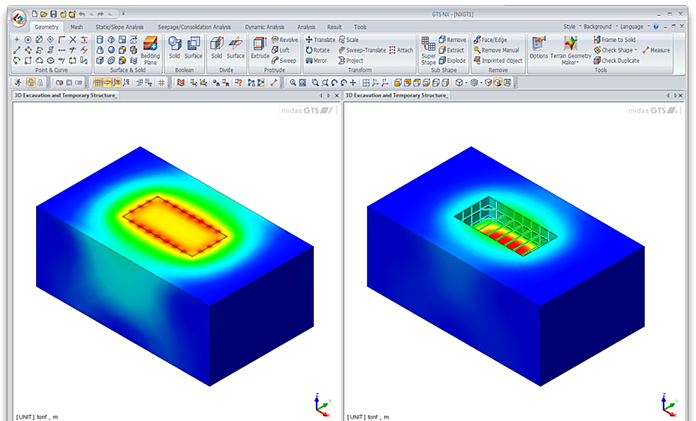 Two types of analysis were performed based on different 3D model files. To monitor the stability of lining structures and rock bolts, at structural level, the final status of the cavern was modeled and to obtain the general stability and settlements of the soil layers, at geotechnical level, construction sequences of the cavern were modeled. We are ready to help you out. MIDAS IT has accomplished impracticable tasks, overcoming the difficult environment of the CAE industry in Korea. By using engineering simulation technology based on our own techniques through high-tech graphics, we have been developing as the biggest company that offers CAE software solution to the world.